As it turns out, my original post on building our smokehouse has been the number one hit that brings people to my blog. Based on the level of interest and/or lack of information out there on the web, I thought I would try to post some more information for people interested in constructing their own smokehouse. This great little book goes through some basic information on smoking food, explains the differences between hot-smoking and cold-smoking, and provides a helpful description of how smokers and smokehouses work. 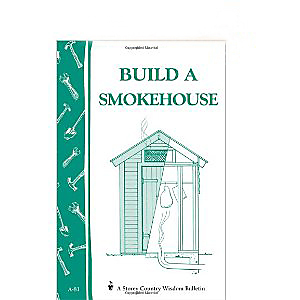 There are also detailed instructions for building a block smokehouse similar to the design that we used, and some smaller smoker projects if you don’t want such a large structure. The “hot smoke pit” is cheap and easy to build anywhere. In addition, the “barrel smoker” and the “box smoker” are also very good alternatives for cold-smoking smaller quantities at a much lower cost. Feel free to ask questions in the comment section and we will do our best to answer them. Great smokehouse, would like to know why you have the bucket in the cement? The bucket was used to maintain the opening for the smoke to enter the house from the firebox.